A wonderful and unexpected surprise for Kate fans tonight! 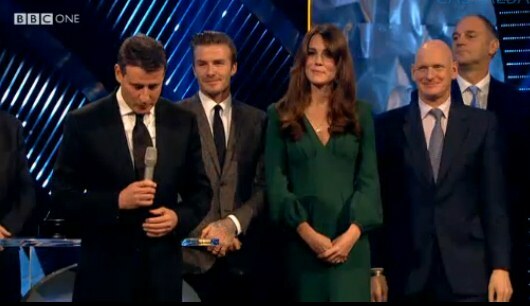 The Duchess of Cambridge attended the BBC Sports Personality of the Year Awards. It had been thought Kate would be kept out of the public eye until Christmas Day at Sandringham, at the earliest, following her hospitalisation at King Edward VII hospital where she was treated for hyperemesis gravidarum, a condition which can leave leave expectant mothers dehydrated. Kate was discharged on December 6 and ordered to rest at home by her doctors. Unfortunately, hyperemesis gravidarum is not a condition that disappears overnight, therefore the Duchess could only attend 45 minutes of the two and a half hour show. I think it shows a great deal of dedication on Kate's behalf that she came out to honour Britain's sporting heroes despite being so unwell. 'The Duchess of Cambridge will tonight attend the BBC's Sports Personality of the Year awards at the ExCeL London, where Her Royal Highness will present the lifetime achievement award and the main sports personality of the year awards. The Duchess will attend the event in response to a long-standing invitation from the BBC'. As you will all recall, William, Kate and Harry were official ambassadors of the London 2012 games and with William currently working as an RAF Search and Rescue pilot in Anglesey, and Harry on a tour of duty in Afghanistan, Kate was eager to represent the royal family and show her support for UK sportsmen and women. The BBC Sports Personality of the Year Awards (also known as SPOTY) takes place annually in December and with an endless list of sporting achievements at London 2012 this year's ceremony is particularly special. A crowd of 15,000 at the ExCeL made it the biggest show in the events 59 year history. Kate and David Beckham presented the Lifetime Achievement award to Lord Sebastian Coe, one of Britain's most famous Olympian's. He won gold in the 1500 metres in 1980 and 1984. Most recently he headed the successful London bid to host the 2012 summer Olympics, and later became chairman of the organising committee of the games. Lord Coe was not aware Kate would be presenting his award until much later in the evening and was no doubt delighted when he found out. The Sports Personality of the Year is the main award of the night. An expert panel drew up the shortlist and the winner was decided by public vote. 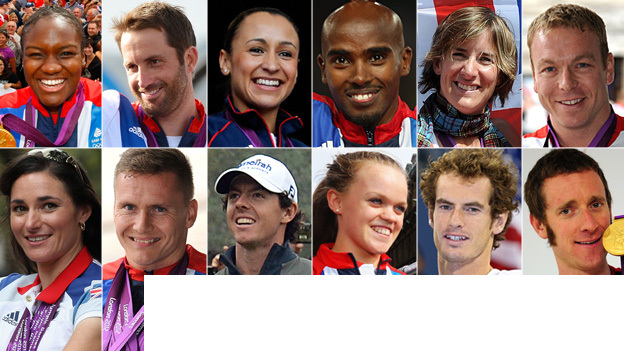 This year's candidates were cyclists Bradley Wiggins and Sir Chris Hoy, tennis star Andy Murray, athletes Jessica Ennis and Mo Farah, Rower Katherine Grainger, golfer Rory McIlroy, boxer Nicola Admas, sailor Ben Ainslie, and Paralympians Sarah Storey, Ellie Simmonds and David Weir. 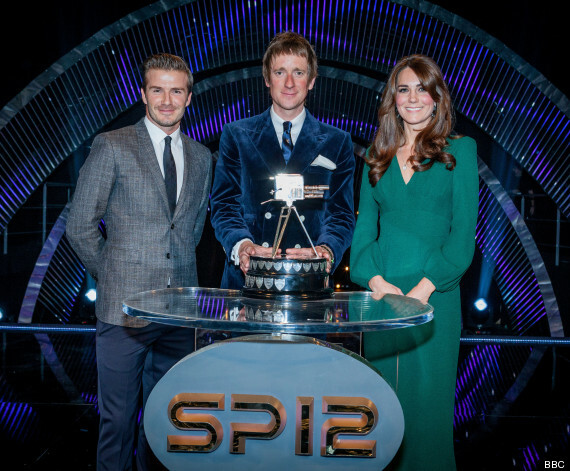 Bradley Wiggins was voted the BBC's Sports Personality of the Year 2012! Kate looked beautiful in the emerald green Alexander McQueen Bell-Sleeve Floor Length Green. The £2,520 gown is 100% silk and features a deep v-neck, trompe l'oeil belt waistband and sweeping central thigh-high slit. A stunning choice. Kate looked amazing and after being so unwell for the past couple of weeks I love that she came out smiling in such a showstopping number. 'Alexander McQueen's floor grazing silk-cady gown is a dramatic way to work this season's passion for peplums. A testament to the London based label's precision tailoring, the darted bust, balloon cuffs and structured shoulders all combine to create a stunning silhouette'. A shorter version of the dress is available in Aubergine for £1,775 and Black and Ivory and for £1,395. Kate accessorised with her Kiki McDonough blue topaz earrings and Asprey Diamond Button Pendant. 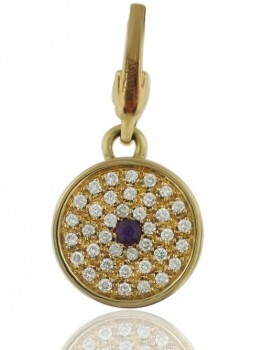 The lovely Susan from WKW kindly shared news the £2800 pendant is now sold out. The Duchess completed the look with her black suede Jimmy Choo Cosmic Pumps. They are available for €525. You can watch a video from the event at the BBC. 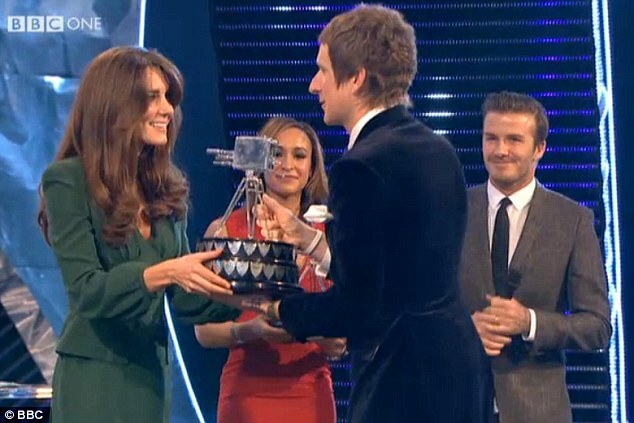 It was great to see the Duchess at the SPOTY awards tonight. I thought she looked radiant and following tonight's appearance I wouldn't rule out more short engagements similar to tonight's in the near future. The Queen's staff Christmas party takes place tomorrow. Kate was expected to attend the event at Buckingham Palace. I imagine it will depend on how she's feeling. Thank you for the first pictures! The Duchess looks very beautiful. Charlotte that was quick--we can always depend on you. I thought Catherine looked beautiful, but rather fragile, but at least it is good to know that she must be feeling a little better. Great to see Kate out & about, but she doesn't look like she's feeling too good. I hope she still feels well after this, poor girl has had a hard enough pregnancy so far as it is. Charlotte, you are the BEST!!! Thanks for the update! Yay! I'm glad she's feeling well enough to make a short appearance. That is encouraging. On the other hand...while it is a pretty dress...I'm not sure I love it. But I'm sure she hasn't felt much like shopping over the past few weeks. I'm with you . . . I think the dress is a weird combination of fashion-forward and frumpy. Maybe it's the styling. I think her hairstyle, which looks similar to the one she had at the Natural History museum event, is a bit aging, which is a shame, because she looks so young and fresh with other hairstyles (in particular the half-up half-down style she had leaving the hospital). Of course, my fashion quibbles are secondary to the real news of the night - Kate feeling well enough to do a public even that's very important to her! Such a treat to see the Duchess tonight - thanks for the quick post Charlotte! I was totally prepared to not see her for weeks if not months. Hopefully this is a good sign that everything with the pregnancy is stable even if she is still struggling with HG. She is only weeks pregnant and her center of gravity will not change for some months yet. So there is nothing wrong with Kate wearing heels for some months yet, particularly as she is used to wearing them. Such high heels are not safe for a pregnant woman. I love wearing high heels, but when I was pregnant, I didn't want to take a risk. However I think Kate likes her high heels alot and she's unlikely to give them up until her center of gravity changes. Then I think we'll see her go to a lower heel. She looks tired, poor girl. I think she is very brave, dont'you? Hate to say it but most of us work through our pregnancies. I'm sure she's well taken care of. She looked stunning. I loved the dress though I'm not a great fan of green, but I thought it looked lovely on the video. Wish we could see her walk with it : stunning slit up the leg ! I`m so glad she looks healthy!!! Not only healthy - she looks gorgeous, as always! Am I the only one who is underwhelmed by this dress? It doesn't seem tailored to her body well. It seems to big in a lot of places. Glad she is feeling better though! I, too, found the dress a bit bland and matronly. I'm sure the luxurious silk fabric made it more stunning "in person" though--and it was immensely appropriate for the occasion. What a pleasant surprise it was to see Catherine looking so good and feeling well enough to go out! Obviously her medications are working--and hopefully she'll be lucky, and the HG will be the short(er)-term type. What a blessing that would be! I wonder if one of the reasons the dress didn't fit exactly is because it was tailored for Kate before she became ill. She's probably lost weight (and she didn't have any to lose! ), along with her body changing due to her pregnancy. dear dear Kate. It's no fun facing people when you don't feel 100% . She looks great, tired yes. Great post and so quick! Question - it is hard to see the detail at the waist - is there a peplum (albeit a flat one) at the waist. Another site is talking about patch pockets but I dont think AMcQ would do that! Where is the video? Can someone please help me find one. Sorry if this is a repeat, but I commented that it's lovely to see her smile again even though she did look tired. I would love the short/dress version of her gown. It has a Lauren Bacall element to it, I think. Charlotte, I'm amazed at the speed of your post. Furthermore, how in the world did you instantly identify that dress as a McQueen? Hi Lynn. The Palace announced the dress was McQueen so it took only a few seconds to locate it on the site. They generally release information on clothing at official events which is very helpful. Thank you I was having ttechnical problems but just watched it. It was great to hear the hearty cheer for her from the crowd. I'm sure she appriecated that after all she has been through. It's also a dead ringer for the red McQueen Kate wore to the River Pageant for the Diamond Jubilee - that gave it away for me - same 'flaps' at the waist. Not sure I'm a fan. I thought she looked lovely and it was great to see her but she looked really tired. Thank you charlotte for the great post and so quick. I loved seeing her beautiful smile. The Duchess looked beautiful & stunning in the green dress.Ithink she looked a little tired but we all would if we had gone through what she just did/still going through. I jsut hope this does not casue a set back for her. I would love to see her get better so she could go back to Wales to be with William. But that will only happen if she is feeling good and the doctors give the ok. I must be hard on both of them being apart during this exciting time in their life. But it was again great to see the Duchess out & about tonight. Hope to see her again only if she is feeling better. Thanks again for all your hard work to bring us this great site. I just watched the video...Kate's hand is shaking terribly as she hands the trophy to Jessica Ennis. I hope it's just due to nerves. When I first saw the dress, I thought, because of the sleeves, it was another one of those awful Beulah London creations. Whatever the dress is doing at the breast area is unbecoming. The color is nice, but I think it would have looked wicked with the belt. Hi, Anonymous! I agree with you, the moment I first saw the dress I imediately remembered the red Beulah London dress she wore last year (I didn't like that dress at all!). But this dress, I really like. She looked pretty as ever! Glad to see she is feeling better! Glad she feels better, but sad to see how she lost so much weight in a short time. I wish health, Kate! Good to see her up and about. Nice dress but it seemed a little overformal for the occasion. However, since the royals do formal dress for Christmas Eve dinner, maybe it was purchased with that in mind? Friends, please do not get me wrong, but I found that Kate appearance at this event something totally unnecessary, considering some factors, among them, hyperemesis gravidarum and the few weeks of pregnancy. Okay, it might be nice to see that she is feeling better, but I think she needed more than a bit of rest, at least until 12 weeks of pregnancy, which is when the placenta is already formed and better "fixed" in uterus. Another thing, the appearance of Kate this event made ​​me wonder if, by chance, she may have been earlier or misdiagnosed with hyperemesis, because it happened to a friend of mine, she spent two days vomiting heavily in the first weeks of pregnancy and when was taken to the hospital, was diagnosed with HG, but after two days stay in the hospital, she felt better and went on to have normal morning sickness, and not more severe. So my friend was diagnosed with HG erroneously because hyperemesis during the first weeks of pregnancy, almost 100% impossible to pregnant doing any activity. Well, it's just my opinion. Kisses from Brazil! She looked as well as could be expected - beautiful but seems a bit tired and probably a bit thin. You can see she is trying, but in spite of myself I feel so sad for her. What a life ! She cannot even rest in peace because half the country is calling for her head. And what a way to be pregnant. Pregnancy is supposed to be such a joyous time, full of hope and happiness. If you spend 6 months wondering when you're going to throw up next I doubt that there is much to enjoy. Poor poor girl. I think that when I saw the bit of her trying to shake Jessica's hand (which was ignored), with her own hands trembling uncontrollably, I saw a glimpse of the simple, sweet person from the counties that William fell in love with. She may be 30 but I suspect that deep inside she is just a loving, warm, shy and simply brought up girl who finds herself in exceptional circumstances and is trying to bear them with so much grace. No wonder William loves her so.. and will, more and more over the years. She seems to have lost the cute chipmunk cheeks she was getting right before and just after the hospitalization. She may be suffering from the much-reported weight loss from HG. I thought otherwise she looked quite healthy and normal. Although she couldn't stay for long at the event, I'm going to take it as evidence that she's feeling better. I sure hope so! Thanks for the quick update Charlotte! So glad she felt well enough to be there and hope she continues to improve. Since when is a thigh high skirt slit "matronly"? Not a wow style but very much Kate. p.s. Would not be anonymous if you used more sign in options. Hi, I'm afraid I don't have any input in the sign in option. The blog is hosted by Blogger and they decide. If you wish to share your name and where you're from without having to have a blogger account: simply select the "Name/URL" option type in the Name field: first name from state, country. You can leave the URL blank. I think we all enjoy knowing where each is from. I agree with your comment about the slit. 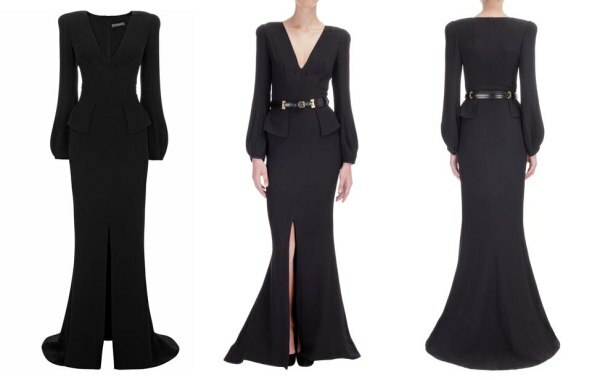 I think people automatically attach a "matronly" label when an evening dress has sleeves. There are very few "matrons" I know who would wear that dress! I think she looks gorgeous! I'm so happy to see her! Thanks! Charlotte do you know what time the Queen's party is tomorrow? I would think if the Duchess attends it will only be for a little bit and solo. William is back in Wales and might not be able to get the time off. Thanks for this great blog. You are the best. Hi Pauline, The Palace don't release timings for those events and should Kate attend I'm not entirely sure we'll see photos. I have been out of town a couple days and was so surprised to log on and see the wonderful post!!! What a treat to see beautiful Kate out and looking lovely. I loved her dress....so pretty! I will say Kate did not look well and her hands were shaking. I haven't had a chance to read previous comments, but did anyone else notice this? I absolutely do not want to be critical, but she seems a bit thinner also. Felt a bit sad for her. It's got to be miserable not feeling well at all and have the worry of becoming sick out in public. After watching a couple videos, I thought she did a wonderful job. A huge "way to go" for making the appearance and keeping her beautiful smile on her face. While I am so thankful and surprised to see her, I hope she can continue to rest up. Charlotte, I read several articles about Kate's engagement tonight and one said that she was 12 weeks pregnant. I don't remember which one it was, but just wondering if you have read this? Thanks for another great post! Hi Kate from Texas- I too read that article but I also read several others and they are saying 13 to 14 weeks. So I don't think anyone really knows but William & Catherine. We should hear something from the Palace soon as to her due month. I read where they will only give the month and not the day she is due. I've seen that too and yet last week she was eight weeks....hopefully there will be an official announcement of the due date in time. Anyone who saw Catherine walk onto the stage could not consider the dress matronly! Anyway what she wore was surely irrelevant--I thought her very brave to turn up. Wow what a great surprise to see Kate again! If her hands were trembling, it was surely because she was nervous in front of so very many people and television viewers, not because she felt ill or tired. No one would have pressured her to be there yesterday if she hadn't felt up to it. She loves sports, and knew most of the athletes. I think it was a boost for her morale to be up and about. It's nerve wracking to be in front of so many people, but she does her job with grace and charm, and I'm sure she loves it. Brave Kate! She's trying so hard, it must be very difficult in her condition. Loved to see her, such a good unexpected surprise! Thank you for the fantastic post dear Charlotte. It was so great to see Kate again. I'm glad that Zara Philips was there to support her cousin. The dress is the same color as one of the circles of the Olympic flag. That, and the circle earrings and the circle necklace makes me think it was all purposeful; she does always include those subtle details. I can't imagine facing a crowd like tht under normal circumstances and feeling well. The video of the crowd was overwhelming. She's very brave, and although she looks tired, it was great to see her. I don't think Jessica meant to ignore her. I imagine she was nervous too. Very good points, Beth. I agree. It looks like there was no time to tailor the dress. It just doesn't hang correctly. Look at the flare of the skirt on the model and look at the bagginess on Kate. Still, it was lovely to see her. Sooo true. I was disappointed in the dress but she looks as lovely as always. I loved that green dress. The length of the gown goes with a gala/awards event and it manages to remain chick and fashion forward. I also think green is a very elegant color for this season. I'm happy she is feeling better (to show up for this event). Hope to see more of her in the coming months. I have to say I was more impressed by Jessica Ennis!!! She looks great in the simple yet bold and flattering red dress. Of course she has the body to pull it of. So fit, so feminine and enviable. As I was watching the first pics I thought, "Jeez I wouldn't want to be next to her... and wish I had her bun" :P and then today I read a headline at the daily mail MOVE OVER PIPPA and on a different article "The athlete showcased her derriere in a figure-hugging Victoria Beckham dress which even helped her outshine the Duchess of Cambridge as they stood together on stage." wow! She looked great! That pic where she is getting her award from the Duchess, wow! Hi Bea- I read that Ms. Ennis did not shake hands with the Duchess after she received her award from her. In the video it show's the Duchess giving the award to Ms. Ennis and then the Duchess extends her hand and Ms. Ennis snubbed the Duchess. I wonder what that was about. It is also all over the twitter (which I don't do but some of the comments were posted on a web site. I hope it was an over sight. I was also pleasantly surprised to see Kate attend such a high profile event. She only stayed for an hour, but it means a lot. I don't want to be critical either, but it's safe to say she's not quite 100% yet. As an aide quotes to the Telegraph, she is still "not firing on all cylinders," but has "made a marked improvement from last week, when her husband had to cancel an engagement." I thought she looked tired and tentative on stage. She did say she the experience on stage was scary, so the shaking may be from nerves. If you've seen the backstage videos of her talking to the hosts & athletes, you'll see that she was quite her chatty self, which was a relief. Overall, kudos to her for putting in an effort. It's reassuring to know she's doing much better. Otherwise this appearance would never have happened. Let's hope she continues to feel better as the pregnancy progresses. HG often recurs and can be brutal, so taking much needed rest is paramount. It's sad if she'll feel obligated to push on with official duties before she's ready. Stay well, Kate! Thank you for these amazing pictures! Duchess Catherine looks beautiful! This is one of my favorite dresses ever!!! You're a super-star, Charlotte for keeping all of us up to date so quickly. Hi Charlotte- Any news if the Ducehss attended the Queens Christma party today for her staff if you know? I have not seen anything on the internet about her attending. If she did maybe we will not see any pictures like you said in one of the earlier post. I hope going out last night did not set her back. She looked just stunning last night. A little tired but what she has beengoing through it is understandable. Hello! No word at all on the Christmas party. It appears it was a very private event. Also no mention of whether Kate attended or not. Pauline - I saw photos of Kate backstage with Jessica Ennis. When Jessica received the award she was obviously excited and didn't see her hand. There definitely wasn't any snubbing going on. Hi Charlotte- I saw an up close clip on E News here in the states and it seems Ms. Ennis did not see the Duchess's hand extended. When the duchess noticed too she pull her hand away real quick. I would not think that Ms. Ennis would do anything to disrespect the Duchess. Is it true that there is a big up roar over this in the UK? Now that I have seen the whole clip I feel sorry for Ms. Ennis. I can just imgine how she is feeling knowing she did not shake the Duchess's hand when given the award. Charlotte, the Daily Mail said the Queen's private Christmas luncheon is tomorrow, December 19. Any word on this? Also, that William and Kate will be attending Christmas at Sandringham. Just wondering if you have any news? The Queen's Christmas Lunch is indeed tomorrow and I think it is a strong possibility they will attend, nothing confirmed but it's possible. William and Kate attended a staff Christmas party yesterday, no photos but Kate was in good spirits. I'll have it all in today's post whether they attend the lunch or not. Still no official word on Sandringham I'm afraid. Thank you so much for the reply. I was glad to hear that William and Kate were out for their staff party. Two outings in the past few days seems to be a good sign. I truly hope she is feeling well and does not have a relapse. Also glad William is back with her in London. I know you will do a wonderful job gathering info on the upcoming events. I am looking forward to the next post! It's almost 8 a.m. in the UK so we'll know in a few hours whether or not they attended the luncheon and I hope to have some news on Sandringham! Seeing the dress in the video sealed it for me- she is just gorgeous and I also really love the green on her. If only she woud do something with her hair! That Bridget Bardot look when she was leaving the hospital would have been perfect. I can't imagine having been feeling ill and then being on a televised even for my first appearance out. 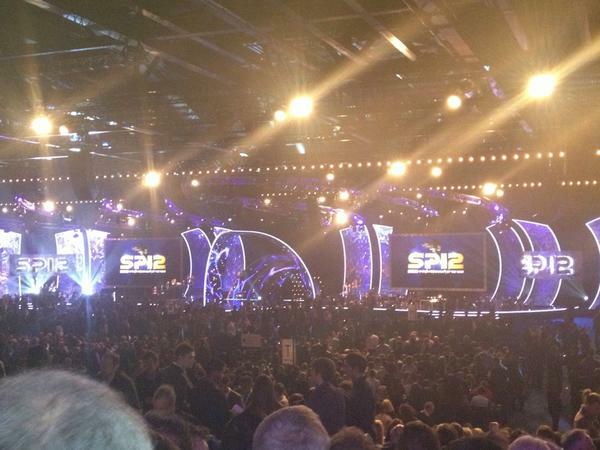 My boss attended the SPOTY event and said that Kate looked lovely but somewhat tired and shakey. He also said that once the cameras were off her, she seemed to wilt a bit, poor girl. It must be so hard being the centre of attention when you aren't feeling 100%. I know when I feel ill, I just want to shut the world out! Thank you very much Annie! I greatly appreciate your insights. I know when I feel unwell going out is the last thing I want especially in front of millions.